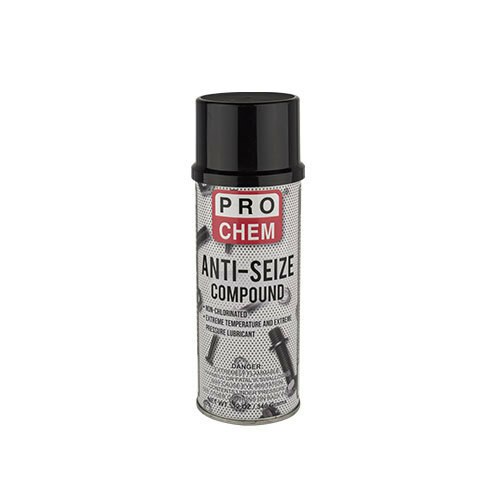 Anti-Seize | Pro Chem, Inc. Prevents galling, seizing, pitting, fretting, corrosion and distortion of threaded, keyed, splined and press fitted assemblies. Protects at sustained temperatures of up to 2100°F. Highly resistant to moisture, weather, chemical fumes, salt spray and steam. Allows tighter, more vibration-proof seals using less torque while making disassembly easier. USE ON: Industrial machinery, construction, farm, mining and earth moving equipment, marine hardware, vehicle fleets and assembly lines. Completely non-corrosive and inert to rubber. Effective on a broad group of metals with metal-to-metal and metal-to-rubber contact. Preclean surfaces to be treated, removing any old contaminated grease, dirt or grit. Shake can thoroughly until agitator ball begins to rattle freely for at least 30 seconds. With can held in upright position, spray surface in short bursts from a distance of 8 to 10 inches. After use, invert can and clear actuator by spraying until only gas is dispelled.